Does your tile deck have cracks? Is it swelling? Or does it seem rock solid on top, but soft underneath? Perhaps it shows signs of discoloration. Whatever the issue, it is likely you have water damage. Tile is notorious for leaking. Not a worry for Prestige Decking! Watch this video to see the AVM 700 waterproofing system in action. Tiles are beautiful but can be expensive. But, the problem isn’t cost as much as the grout. Tile deck grout seeps water, like any other concrete based material. So, while you are enjoying the look and feel of your tile, underneath there could be pooling water. Pooling water = bad. After a while, it causes dry rot in the wood sub-floor or structural beams. worse yet, oftentimes a deck repair under tile does not allow for tile salvaging. You get zapped twice. 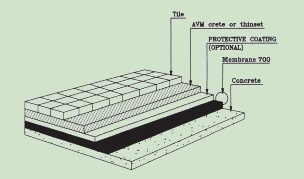 AVM Industries has developed a fantastic system for tile deck underlay. Here are their steps (go here for all the details). 1) Install a 6 inch wide membrane strip at deck perimeters, joints, cracks, sheet metals, drains, scuppers, posts, door ways, entry ways, etc. 2) Use a wider strip if the 6″ strip will not provide adequate waterproofing protection. 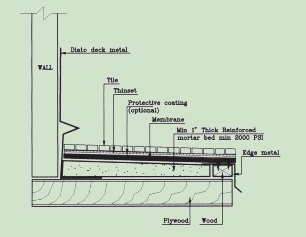 4) Protective coating (optional with the following exception: required when membrane is installed directly to plywood substrates). 5) Protective layer: apply the AVM Crete 6700 over the cured membrane 700 at least 1/8 of an inch thick. Now your tile deck underlay is complete! Prestige Deck Coating works with each customer to meet individual needs. We use eco-friendly products. We offer 10 year warranties on most systems. Our supervisors each have at least 30 years experience in the deck coatings industry. Call us today for a free onsite estimate to waterproof you tile deck!